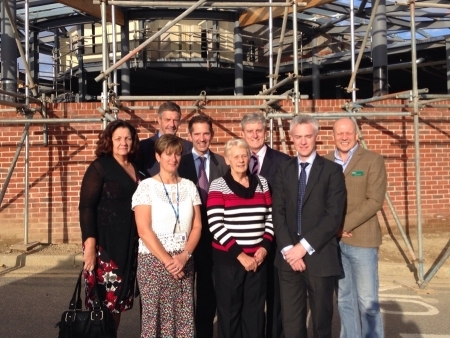 Jonathan Djanogly joined staff and supporters to hear about the latest progress on a state-of-the-art new cancer centre at Hinchingbrooke Hospital. The new Macmillan Woodlands Centre, due to open next year, aims to increase the capacity for treatment, bring outpatient oncology services together, improve conditions for staff and allow patients to receive treatment in the best possible environment. Over the past two years, £1.2 million was raised through fundraising efforts from staff, patients, the general public and the Trust, and in February this year, Hinchingbrooke Hospital joined forces with Macmillan Cancer Support to launch an appeal to raise a further £1.2million for the centre. Building work started on the centre in March this year. Jonathan was joined by Lynda Hall, Macmillan Lead Nurse for Cancer and Palliative Care at Hinchingbrooke Hospital. Lynda has worked at the Trust since 1995 and knows firsthand the impact the new centre will have: “I’ve seen the number of people coming through the centre grow and grow, so the plans to expand and improve the centre will make a huge difference for staff and patients alike. We are delighted that Jonathan is getting behind the appeal to make our dream a reality. “The local community has shown us incredible support since we started fundraising with Macmillan in February and the total is now nearing the £60k mark. Since work started on the site six months ago, the building has come a long way, with steelworks now complete and block- and brick-work still ongoing. People wishing to support the £1.2 million fundraising appeal are being urged to call Macmillan on 0300 1000 200 or visit the special Macmillan Woodlands Centre appeal page www.macmillan.org.uk/hinchingbrooke. Local business interested in supporting the appeal are invited to join the Woodlands Business Champions Club. In return for pledging to raise £1,000, they will receive publicity via the Hunts Post in print and online and via local Macmillan social media pages, as well as recognition within the new Macmillan Woodland Centre. Email fundraising@macmillan.org.uk for more information.